While it may be just a temporary case of “winter blues” for most people, for others the long cold days of winter can be a serious psychological problem. It’s called Seasonal Affective Disorder – and never has an acronym been more apropos: SAD. Two seasonal patterns of SAD have been described: the fall-onset SAD and the summer-onset SAD. 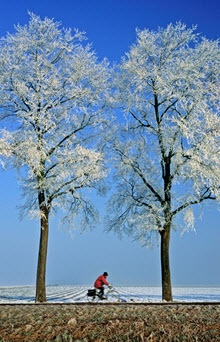 The fall-onset type, also known as "winter depression," is most recognized. In this subtype, major depressive episodes begin in late fall to early winter and decrease during summer months. Dr. Pace adds that some of the symptoms of SAD include increased appetite, weight gain, sleep loss, decreased energy and lack of motivation. The cause of SAD is not well understood. It is believed that the decreasing daylight available in fall and winter triggers a depressive episode in people predisposed to develop the disorder. However, no studies have established a causal relationship between decreasing daylight and the development of winter SAD. One of the most effective remedies for dealing with the condition is light therapy. Light therapy has proven effective in a limited number of small, placebo-controlled studies. The usual dose is 10,000 lux (the intensity of light that hits or passes through a surface) beginning with one 10-to-15 minute session per day, usually in the morning, gradually increasing to 30-to-45 minutes per day, depending upon response. It may take four-to-six weeks to see a response, although some patients improve within days. Therapy is continued until sufficient daily light exposure is available through other sources, typically from springtime sun. Light therapy is considered first-line therapy in patients who are not severely suicidal, have medical reasons to avoid antidepressant drugs, have a history of a positive response to light therapy, or if the patient specifically requests it. 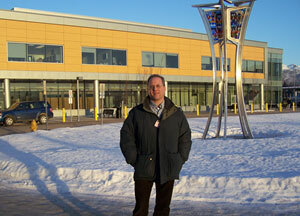 Dr. Pace standing in front of the Anchorage VA outpatient clinic. Medication is also an option in some cases. Drugs may be a better option in patients with significant functional impairment or who are at high suicide risk, for patients with a history of moderate to severe recurrent depression and for patients who have had a prior positive response to antidepressants or mood stabilizers or who have failed other therapies. Dr. Pace recommends that any Veterans experiencing unusual depression during the winter months should see their VA doctor as soon as possible.